Vicenza Stone Sculpture executed entirely by hand by our sculptors. 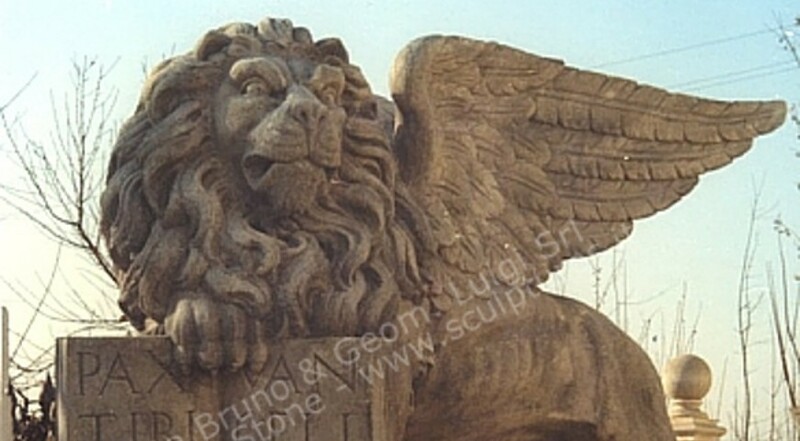 The winged lion is the symbolic representation of the evangelist Saint Mark, depicted in the form of a winged lion. The symbolism of the San Marco Lion derives from an ancient tradition of the Venices, according to which an angel in the form of a winged lion would have turned to the saint, castaway in the lagoons, the phrase: "Pax tibi Marce, evangelista meus. Hic requiescet corpus tuum". The Lion of San Marco is a centuries-old symbol of the city of Venice and its ancient Republic. Dimensions: Height 59" x Depth 35 1/2" x Width 78 1/2"